I love making skins for The Neurotic Fishbowl. Feel free to try out different ones and pick a favorite to use or you can come here and pick a new one every day. Select a skin here! 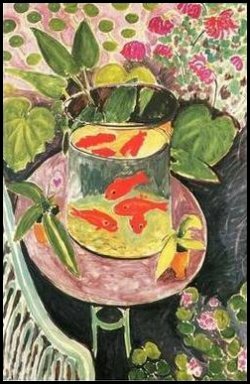 This skin (number 1) features a Matisse piece that I love with a beautiful fishbowl. Christine made these lovely graphics for me to get me started in the blogging world. It is friendly to Netscape 4, although it looks better in IE. Make this one your skin. This skin (number 2) is of the famous kiss between a nurse and sailor at the end of World War II. It is friendly to Netscape 4, although it looks better in IE. Make this one your skin. This skin (number 3) features a design created just for me by Brandy. It is not friendly to Netscape 4, so please only use IE for this one. Make this one your skin. This skin (number 4) is one I created with featuring a beach and some starfish. It is not very friendly to Netscape 4, so I would suggest using only IE for this one. Make this one your skin. This skin (number 5) is one I created using a beautiful graphic of birds, colored by April Martinez. The image originally came from Tiffany Designs Stained Glass Coloring Book by A. G. Smith. It is friendly to Netscape 4, although it looks better in IE. Make this one your skin. This skin (number 6) is one I created using an image of dogwoods that was taken by Dawn Mikulich. I wanted to have a skin that celebrates spring, so it is full of light colors. It is not friendly to Netscape 4, so please only use IE for this one. Make this one your skin. This skin (number 7) is one that Kristine made and was kind enough to personalize for me. It is a cute and fun look for The Neurotic Fishbowl. It is not friendly to Netscape at all, so please only use IE for this one. Make this one your skin. This skin (number 8) was created for me by a co-worker, Tod Gilpin. He was creating a site for a client using this image and, knowing how I love fish, offered to make a header graphic. It's a very cool design and I am delighted to have it as a skin. It is not friendly to Netscape 4, so please only use IE or Netscape 6 for this one. Make this one your skin. This skin (number 9) I created for Christine since she loves images of doors. I figured since our blogs are set up so similarly, it couldn't hurt for us to have the same skin. It is not friendly to Netscape 4, so please only use IE or Netscape 6 for this one. Make this one your skin. This skin (number 10) is based on the way that Christine showed off the last images from her Pixelog. Since I am always adding new images to my photolog Picture Fish, I figured this would be a great shortcut for people to see the last ten added. It is not friendly to Netscape 4, so please only use IE or Netscape 6 for this one. Make this one your skin. This skin (number 11) was created by Trish. She was even nice enough to make me a custom header for it. If you're in need of some gorgeous blog templates, go visit her. It is not friendly to Netscape 4, so please only use IE or Netscape 6 for this one. Make this one your skin. This skin (number 12) came about when that tart, Sheila, found the cute little pin-up girl. I adore both it and her. It is not friendly to Netscape, so please only use IE for this one. Make this one your skin. This skin (number 13) was created by that tart, Sheila. It's a little risque, but still deliciously gorgeous. It's done completely in CSS and tends to have overlap on resolutions lower than 1024 x 768, so please only use it on higher resolutions and only on IE. Make this one your skin. This skin (number 14) was created using a header graphic featuring the gorgeous Shirley Manson of Garbage that Robyn made available on her site. It only works on IE, so please don't use Netscape with it. Make this one your skin. This skin (number 15) was created because I wanted to celebrate Valentine's Day in style. I modified skin 14's header graphic with a pin-up that Robyn found. It only works on IE, so please don't use Netscape with it. Make this one your skin. This skin (number 16) was created based on a template found at CSS Colouring Book using a picture of a lionfish I took with my digital camera. It works with IE and Netscape 6.0 and above. Make this one your skin. This skin (number 17) is a template that Erika created and put up for download at Miz Dos Graphics. It works with IE and Netscape 6.0 and above. Make this one your skin. This skin (number 18) was inspired by the Evian image that I found while surfing the web one day. I then thought of the great backgrounds at Pixel Decor and this retro idea was born. It works with IE and Netscape 6.0 and above. Make this one your skin. This skin (number 19) was inspired by Jim Benton's wonderful character Happy Bunny. If "cute but psycho" doesn't describe The Nuerotic Fishbowl, I don't know what does. Make this one your skin. Many thanks to Amy for all of her hard work on researching how to skin a site and documenting what she learned. If you would like to skin your site - PHP required on your host's servers - read her tutorial and learn how.